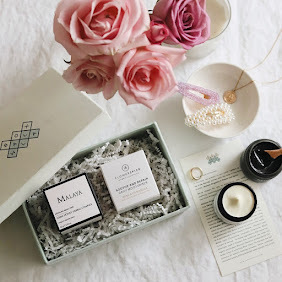 It's not long since I've shared my current morning skincare routine (see here), which I actually already changed a little bit after receiving all the April subscription boxes. I still love the products I mentioned in that post and use a few of them still (especially my love, the Earthwise Beauty Farizad's Veil Sun Protective Powder) but since I usually use pretty much the same products in my morning & evening routine I thought I should mix it up a little and share my evening skincare routine with you today. 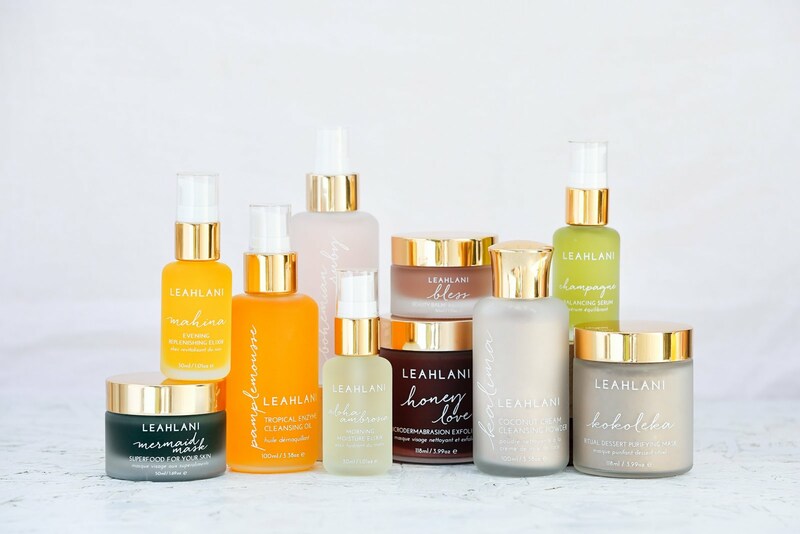 I haven't been using some of the products I'm going to mention for long but I saw such dramatic difference in my skin when I started using them that I just can't keep them to myself! I start with cleansing my face and removing my makeup (if I have any on since I don't wear makeup every day). 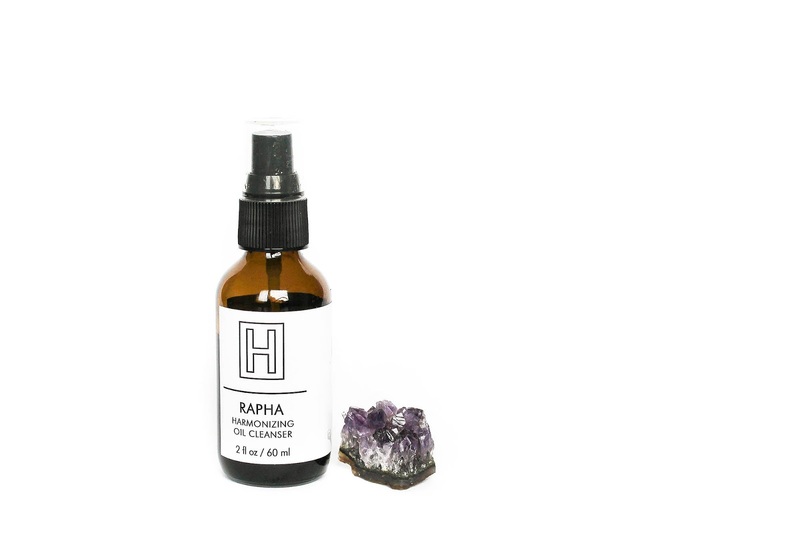 I went back to the precious and the most beautiful oil cleanser, Rapha Harmonizing Oil Cleanser* from H is for Love. There are some products that just blow me away immediately and this cleanser is definitely one of those! Rapha has the most calming and soothing scent of Chamomile which is just perfection to use in the evenings. 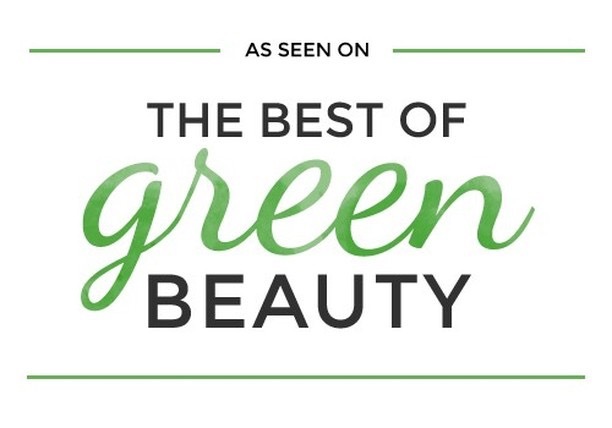 It has an array of wonderful ingredients, including Olive, Hemp and Pumpkin Seed Oils. I love that it also contains Castor Oil which really draws out impurities from pores. 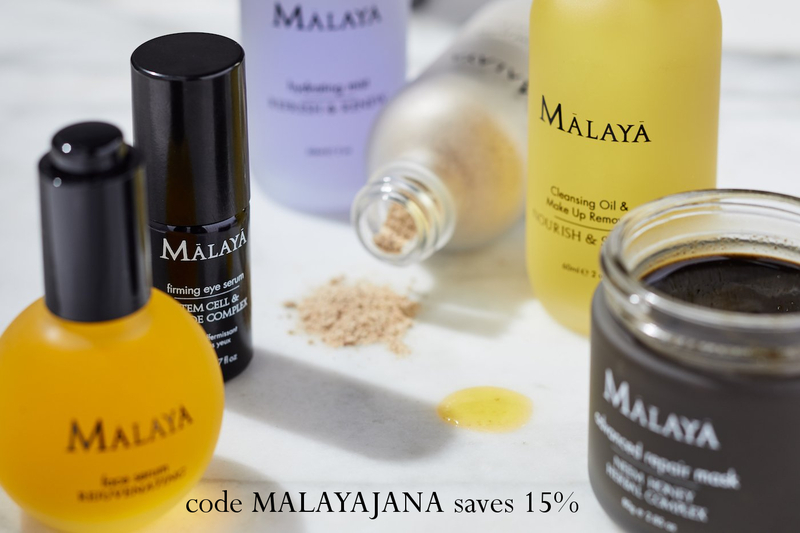 I love massaging this oil on my skin for a while which doesn't happen with every oil. There is just something so beautiful about the scent that I really don't want to stop. A longer massage is also more beneficial to the skin since you warm it up and all the makep and impurities melt away more effectively. I remove everything with a warm wash cloth and my skin is left soft, properly cleansed and calmed. I've already talked about this oil here but I will also do a rave review because this product really deserves is. It depends if I'm wearing makeup or not but I either leave it at that or I repeat the first step, or go in with another cleanser (Siam Seas Morning Delight* or Luxe Botanics Camu Brightening Cleanser*). You can get it straight from their website or if you live in Europe you can get Rapha here. 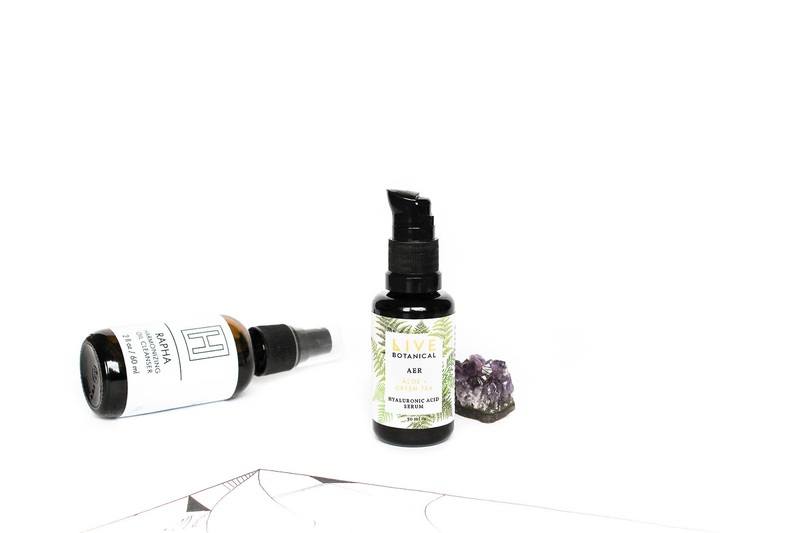 More times than not I don't use a toner as my next step (I use Amly Botanicals Beauty Sleep Mist* if I do use it) but I rather use AER Aloe + Green Tea Hyaluronic Acid Serum* from Live Botanical (review here). This serum is so lovely! 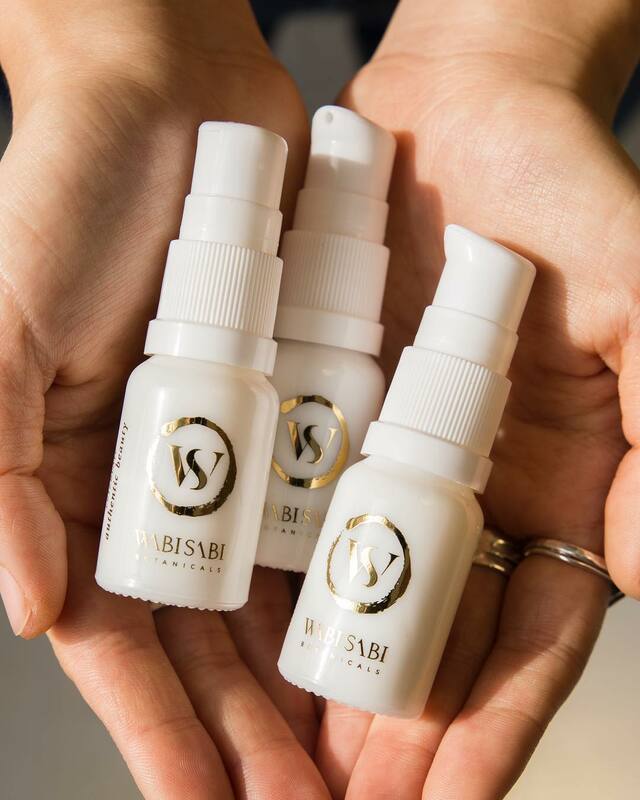 It has only four ingredients, it is very lightweight but it packs a punch of hydration and is just the perfect toner/serum product to use after cleansing. I really am impressed with this serum and I recommend it for all skin types. 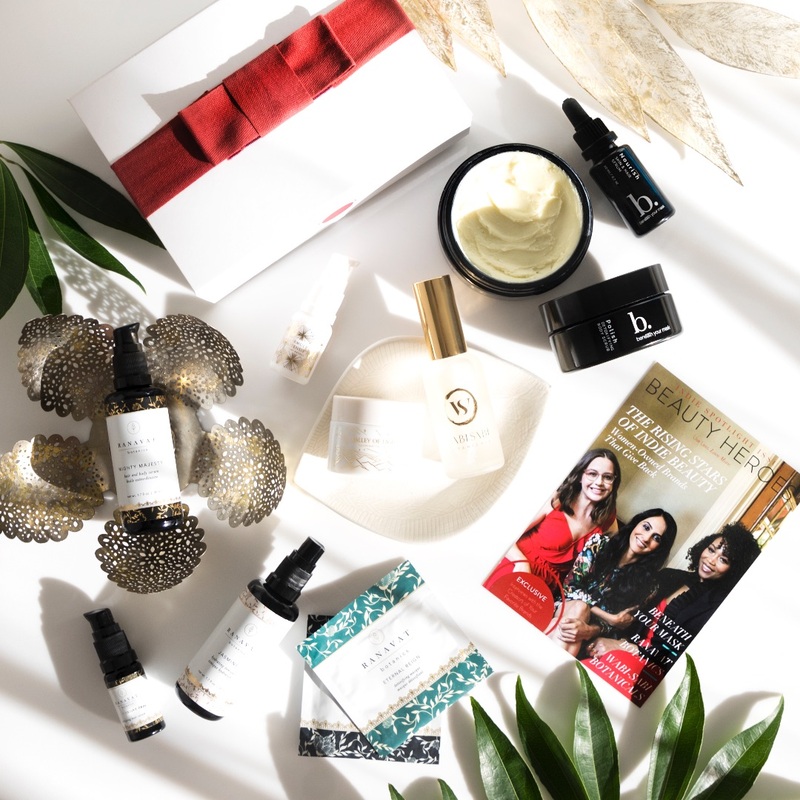 You can get it in the April Art of Organics Clean Beauty Box* here or on Live Botanical website here. Next is another serum, this one is packed with antioxidants and since it's not the most hydrating serum it really layers well with AER. 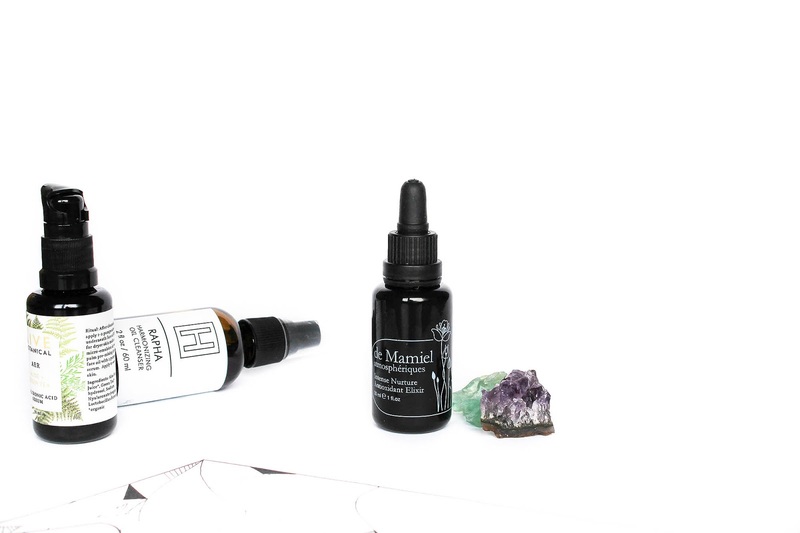 I'm talking about the Intense Nurture Antioxidant Elixir* from de Mamiel. These two serums really work together SO beautifully and if you are subscribed to both boxes (BH & AO), then I highly recommend you try them together. This elixir has a complex list of ingredients, including different kinds of antioxidants that work at a different stage of oxidations and I find that so interesting. I won't go into too much details but trust me it is a beaut! You can find more information about it in my review/first impressions here. 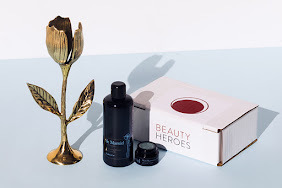 Intense Nurture Antioxidant Elixir was the Hero product of the April Beauty Heroes Beauty Discovery but the box quickly sold out (not surprised) but you can get it in their store here (members have 15% off their order). Next step is an eye serum and this will not come as a surprise if you saw My Current Morning Skincare Routine here, I'm still loving Maya Chia's The Eye Achiever*. It's not a wrinkle eraser but it does keep the skin around my eyes nicely moisturized and hydrated and I'm all about that. 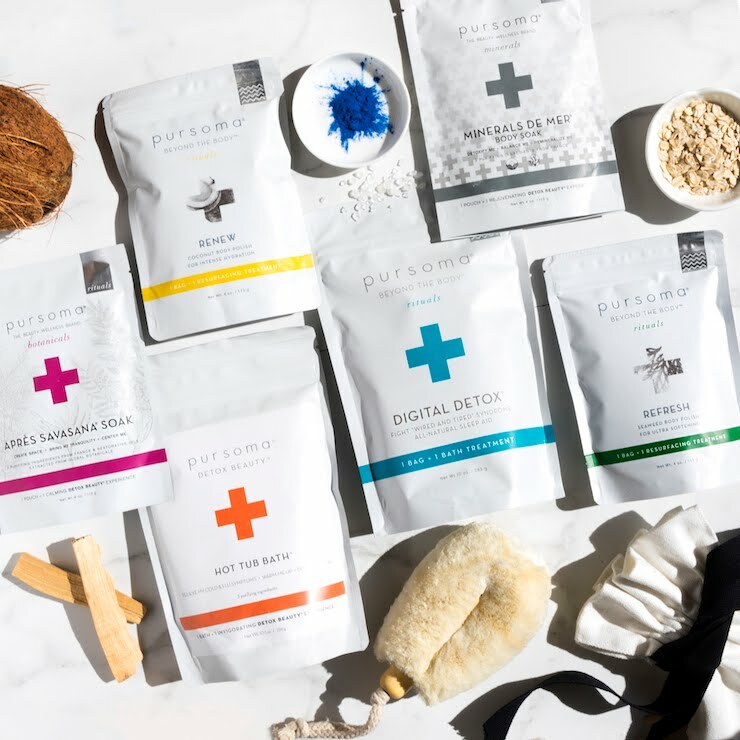 It's filled with ingredients that are rich in antioxidants, like Chia Seed Oil and Astaxanthin. It comes in this very practical roll-on ball packaging which is a joy to use. One or two swipes are plenty and I just tap the serum into my skin and that's that. You can get it here. I then follow up with another oil serum, this time for the rest of my face and neck. Of course I can't forget about the neck - all the products I apply on my face I also apply on my neck. 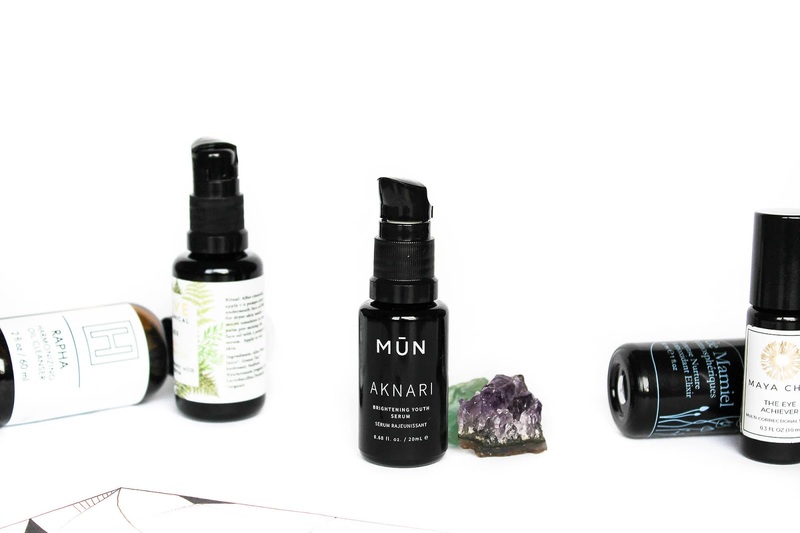 So the oil I started using is the Aknari Brightening Youth Serum* from Mun Skincare and I really love this little uncomplicated baby. 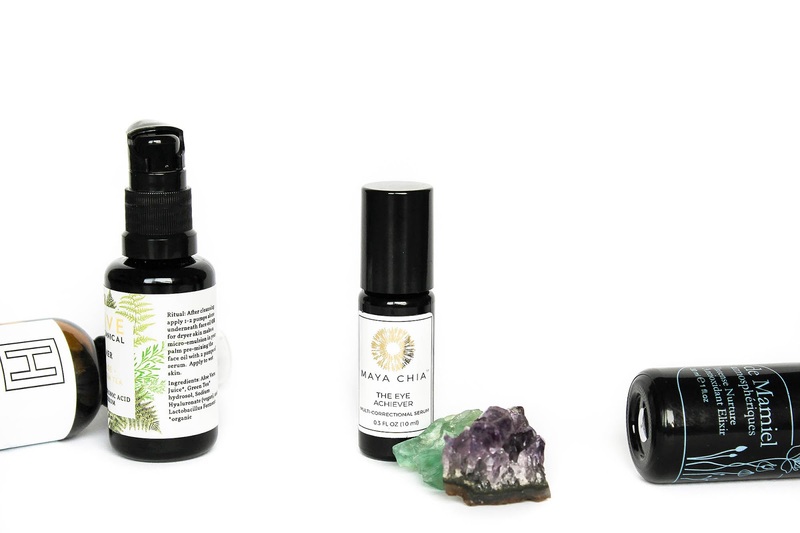 I say uncomplicated because it only has three mighty ingredients: Prickly Pear Seed & Argan Oil and Bulgarian Rose. The scent of roses is divine, the serum is light and is quickly absorbed into my skin. I got this oil in a Boxwalla Beauty Box (review here). You can get Aknari here or at the Beauty Heroes store here. 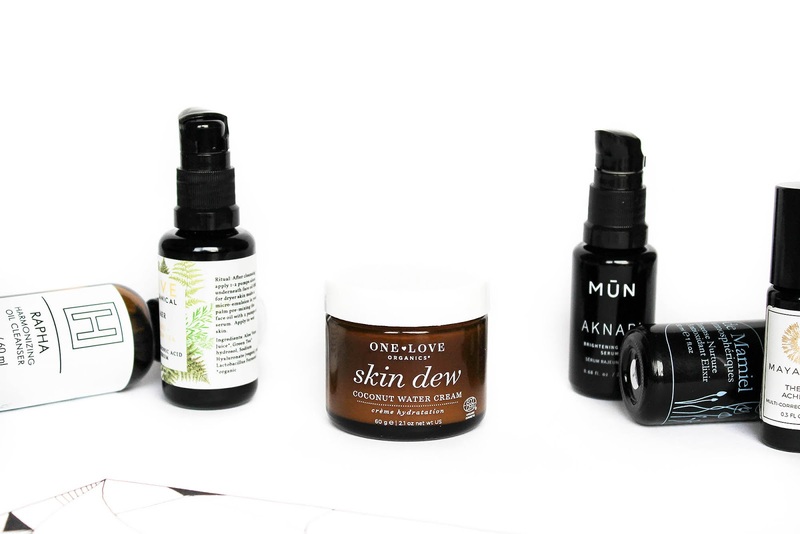 Last but most certainly not least is the product that truly swept me of my feet upon first application - the incredible Skin Dew Coconut Water Cream* from One Love Organics. This cream is something else! I can't express how much I love it and how quickly I fell in love with it. Oh it is just dreamy! 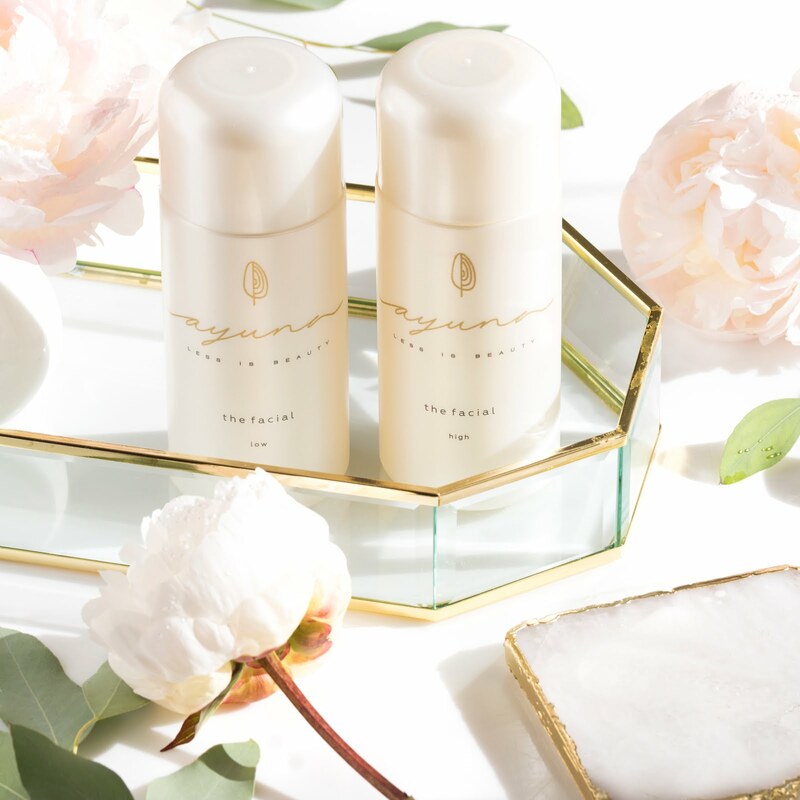 It's very lightweight and airy but at the same time it's also very hydrating and skin softening. It smells like coconut water, so nothing strong or overpowering which I always love. It's the perfect cream to end up my evening skincare routine. This is a cream that you simply have to try, no matter your skin type! 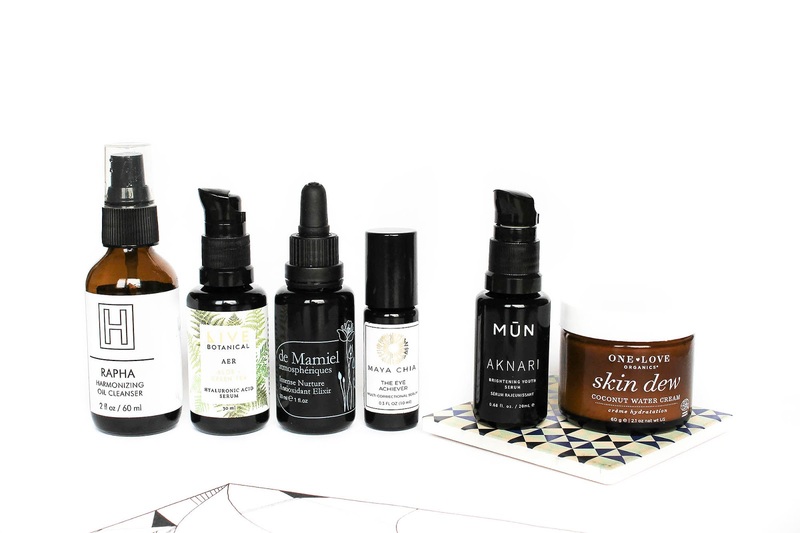 I've recevied Skin Dew in the April Art of Organics Clean Beauty Box (see my review here) and the box is still available so you better subscribe asap. I really do highly recommend this box and this cream so don't wait up for it to be sold out. 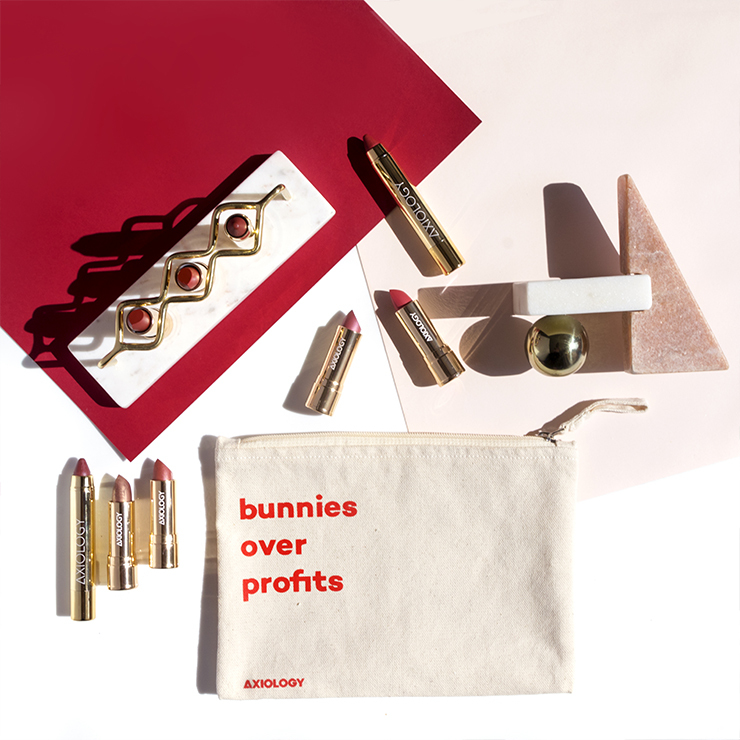 You can get the April box here or click here if you only want the cream. As you can see my current skincare is a bit full on but I simply adore the combination of all the products! It's all about hydration and that makes my combo skin so happy and healthy. If you have any questions do let me know, I'm happy to help.